The Rotorua district has a multi-cultural population of approximately 70,000 people; some 35% are Maori. Rotorua city is located on the southern shore of Lake Rotorua , while the district includes a number of rural and lakeside communities. 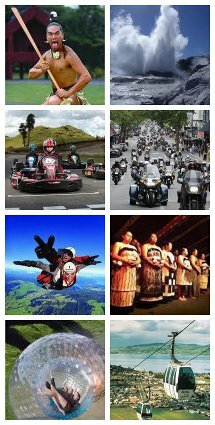 An international tourism icon, Rotorua is renowned as the heartland of Maori culture. There are 16 lakes in the vicinity of Rotorua, many of which are fishable lakes packed with rainbow and brown trout. The lakes, all formed from the craters of extinct volcanoes, are a popular attraction for many water-based activities. From the moment visitors enter Rotorua they know they’re somewhere quite different. Whether it’s the sneaky threads of steam finding unlikely escape routes in parks, pathways and streets or the distinct scent of sulphur wafting through geothermal hot spots, Rotorua offers an impressive welcome.